The Camaro is turning 48 years old in 2016, to commemorate the event Chevrolet wanted to have a media drive throughout 48 states. Did I mention that they wanted to tackle this feat in a month?! The moment the email hit my inbox, “Dear Camaro Road Warrior,” it began. I was challenged to “Find New Roads,” and thus the planning began. Chevrolet had designed an East and West route and we were to list our top four options AND we could bring along a photographer. Our route took us from Philadelphia, Pennsylvania to Raleigh, North Carolina. We had 36 hours to get from Point A to Point B, not a problem for a car as fast as the 2016 Camaro. With less weight and more power the 2016 Camaro has the right combination for performance success and we couldn’t wait to put it to the test. We kicked things off at breakfast where we randomly drew for keys. My friend and fellow journalist let out a “YES” when he drew the keys to a Chevy Camaro SS V8. I was just as excited to end up with a V6 standard in bright yellow. Around 8:30 a.m. we were in the parking lot checking out our new ride and shooting pics. I might mention here…. what good is a road trip without travel games? We were given “Points of interest” to check-in for points, as well as extra points for stopping at a bonus state (a state that was somewhat out of our way). Our bonus state was New Jersey. Add 350 points to my score please! Our first stop was Dover Raceway. Remember we had to #findnewroads and remember my aforementioned planning? I never knew the nation’s largest sports statue was a monster named Miles until I found him while surfing the internet. I quickly placed a phone call to the raceway and spoke to Mike. After an approval process, it was determined that we could indeed drive our flashy yellow car right up to the statue. As excited as we were for the photo ops, we knew we wanted to do more to make this a memory that we wouldn’t forget. I know, you are guessing that we wanted to take the Camaro on the track, right? Wrong. Chevrolet rules stated that no vehicles would be driven on a track without supervision. So, we did the next best thing, we decided to dance. Miles after all is a monster and Halloween was fast approaching, so we did the “Monster Mash.” You can view that dance somewhere online using the hashtag #findnewroads, or by liking The Motor Mistress on Facebook. So how did the car perform on the way to Dover, Delaware? Like a champ! While we did not enjoy the traffic from New Jersey to Delaware, once we were on the open highway we found the sixth generation Camaro to be refined and responsive. This generation has a leaner and stiffer platform to contribute to performance through reduced aerodynamic lift for better handling and efficiency. Chevy says 28% stiffer than the previous model and 223 pounds lighter. It’s the most efficient Camaro ever, delivering more than 30 mpg on the highway. In Milton, Delaware we checked out a U.F.O. The owner who called the U.F.O. home came out to check out our car. We agreed that both were “out of this world.” Bonus points for finding our own “point of interest” that was not included on Chevrolet’s list. We did stop at another check point in Milton, the Dogfish Head Craft Brewery. Yes, you heard me, Chevy not only asked me to test drive the new 2016 Camaro but they let me stop at a Brewery while doing so. Crazy huh? I love my job. Truly you should know that Dogfish Head Brewery was chosen because they created a philanthropic branch that supports charitable organizations with both grants and beer for fundraising events. 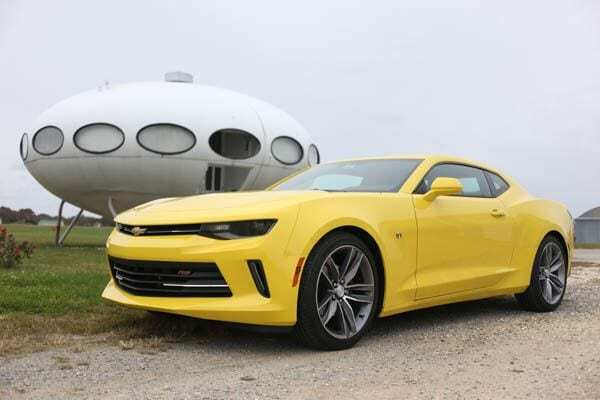 After a quick stop in Rehoboth Beach for some of Thrasher’s Original French Fries, we called it a night in our nation’s capital, Washington, D.C.
Chevrolet went above and beyond to talk to previous Camaro owners and enthusiasts. In doing so, they were able to develop this sixth generation that out-performs all predecessors. “Redesigning the Camaro is thrilling and challenging all at once, but the secret is to offer something more,” said Mark Reuss, General Motors executive vice president of Product Development. “For Camaro enthusiasts, it retains iconic design cues and offers even more performance. For a new generation of buyers, the 2016 Camaro incorporates our most innovative engineering ideas with finely honed performance and leading design.” We were lucky enough to attend one of these events while out on the road. Active Fuel Management (cylinder deactivation) and Magnetic Ride Control active suspension are available on the Camaro SS for the first time. All new Drive Mode Selector has four mode choices: Snow/Ice, Tour, Sport and on SS models, Track settings. The morning brought rain from D.C. all the way to Charlottesville, Virginia but surprisingly the weather didn’t put a damper on things. Some of our best pictures were taken in beautiful Monticello. The designers went above and beyond to make this generation more personable to consumers, offering 10 exterior colors, five interior color combinations, lighting options and a plethora of accessories including wheels, and stripe packages. The interior has a center console that is designed specifically for the driver. The controls are easy to reach and easy to use. The air vents have control rings around them that allow you to adjust the fan speed and temperature, eliminating the need for extra controls. The flat bottom steering wheel and quality materials make the cabin complete. It is completely driver focused. The 2016 Camaro has some serious technology. Operating from the Chevrolet MyLink system, Apple CarPlay is the smartest way to use your iPhone when on the road. Chevrolet is the first car brand to introduce SiriEyes Free Functionality. Here’s a glance at what Apple CarPlay offers: View Apple Maps on the instrument panel and control via Siri. CarPlay can also predict where you might want to go using addresses from your email, texts, or calendar. Siri can read, send and reply to text messages for you so you don’t have to look at your phone while driving. You can make calls, return calls and listen to voicemail just by asking Siri. Access your songs, playlists, artists and iTunes Radio using the car’s built in controls, or simply tell Siri your listening choice. CarPlay will also support select audio apps such as Spotify or Pandora that you’ve downloaded to your iPhone for enjoying podcasts, music and radio. CarPlay works with any iPhone 5 or newer, and uses your phone’s data plan for Siri, navigation, and audio streaming. Camaro’s instrument cluster features analog instruments as well as an 8-inch high definition center screen that can be configured to provide additional information including navigation, performance and infotainment features. I love the dual heat and a/c controls with rings around the air ducts. No need for conventional buttons, the control rings are used for temperature and fan speed adjustments, handy and easy to keep your eyes on the road. Another segment first and favorite of mine, the LED ambient lighting system integrated in the dash, door panels and center console, offering 24 different colors as well as fade and transition effects that spread across the interior. No surprise, there’s even a theatrical “car show” mode that cycles randomly through the entire color spectrum when the Camaro is parked. The Camaro’s standard engine is a new 2.0L Turbo with 275 hp and 295 lb-ft of torque. The Camaro I’m driving is the 3.6L V-6, available on the Camaro LT and producing 335 hp and 284 lb-ft of torque for the highest specific output of any naturally aspirated V-6 in the segment. The 2016 Camaros are built in Lansing Grand River, Michigan. The car I was driving begins with a base price of $26, 695. That extra “YES” that my friend let out earlier cost approximately an extra $10,000. The base price for the SS is $37, 395.